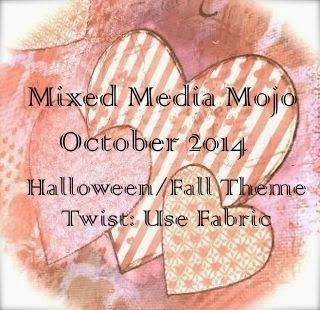 and it's also for the monthly challenge there, Halloween or Fall colours with a twist of fabric. I'm also adding it to Simon Says Monday Challenge, Finishing Touch. Woot, woot! Love this card, Shirley!! She's super stylish! Really fabulous card, Shirley! I love how you used your inks for the raincoat and flowers and your little fabric patch is such a great touch! Very clever! Wonderfully cool card!! 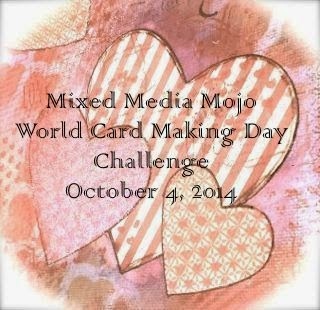 Thanks so much for playing along with Mixed Media Mojo for World Card Making Day! Well worth the time & effort with all that masking - the end result is incredible! Her gorgeous trench coat looks like real leather! Look at your stamp set all inked up and on a card! You must be very proud!